Teaming With Microbes: The Organic Gardener's Guide to the Soil Food Web (2010) is a must read for organic growers. The primary principle and heart of "organic" growing is the soil, the organic matter content, and the soil biological activity that is the core of the life processes. You have heard the term "Soil-Food-Web", well this book is the nitty-gritty explanation of what that is all about, how to work with it ('Teaming', play on words with 'teeming' = abundance), and how not to destroy it. You know there is life in the soil, but did you know exactly what type of organisms are there and what they do and how they inter-relate with each other and how they nurture you plants, facilitate nutrition, and fight pathogens and pests? Now you can get a good idea of what goes on, and why chemical farming is destructive to the beneficial organisms and complex natural processes. After the amazing first part on the science of the matter, the second part is all about the practical applications. I particularly liked the chapters on Compost, Mulch, and Compost Tea, what they are, what they are not, and how to make them and make the best use of these important gardening/farming methods and materials. 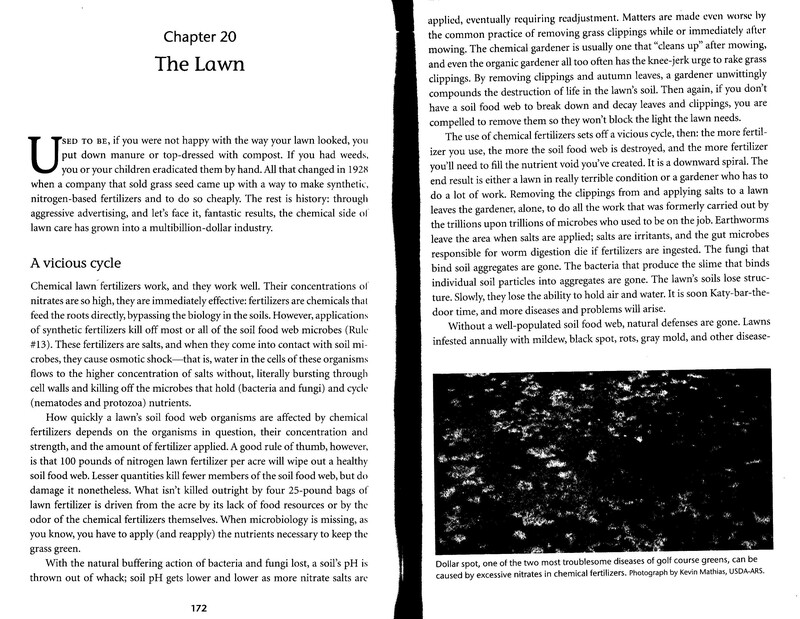 The chapter on Lawns will be of interest to some, and the first couple of pages (attached) gives you an idea of the theme of the book. Island Guy take note, the chapter on Mulch answers some of your questions from a previous discussion here.